FREDERCK JOHN ROBINSON, VISCOUNT GODERICH AUTOGRAPH LETTER Cover Signed. British Tory and subsequently Whig politician. Prime Minister from 1827 to 1828. 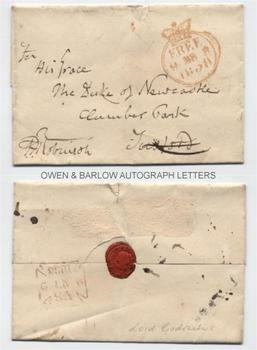 Autograph Letter Cover, signed by Goderich (as F.J. Robinson) and addressed in his hand to His Grace The Duke of Newcastle, Clumber Park, Tuxford. With Free Frank dated 9th March 1838 and with the stamp of the receiving post office on the verso and his red wax seal, impressed with his heraldic device. 4to folded sheet, measuring approx 4.75 x 3.25 inches when folded. Some mounting traces to verso, slight nick to top edge, else fine. Goderich succeeded George Canning as Prime Minister but his administration was short, lasting only 5 months. Goderich had been an able minister (serving firstly under Robert Peel and then as Lord Liverpool's Chancellor) but he was less sure when leading his Party. It was reported that when he went to see George IV to resign his premiership, he burst into tears and the King had to lend him a handkerchief. Goderich was succeeded by the Duke of Wellington. Lord Goderich was styled the Hon. F.J. Robinson to 1827 and the Earl of Ripon from 1833. His signature after 1827 as "F.J. Robinson" is therefore somewhat unusual.